The salmonella bacteria that has sickened more than 400 people in 43 states has been conclusively linked to peanut butter, Minnesota health officials announced Monday. Federal officials said the outbreak may have contributed to three deaths. State health and agriculture officials said last week they had found salmonella bacteria in a 5-pound package of King Nut peanut butter at a nursing facility in Minnesota. Officials tested the bacteria over the weekend and found a genetic match with the bacterial strain that has led to 30 illnesses in Minnesota and others across the country. "The commonality among all of our patients was that they ate peanut butter," said Doug Schultz, a spokesman with the Minnesota Department of Health. While the brand of peanut butter couldn't be confirmed in every case, the majority of patients consumed the same brand, he said Monday. "This certainly is one pretty definitive piece of evidence in this case," Heidi Kassenborg of the Minnesota Department of Agriculture said Monday. 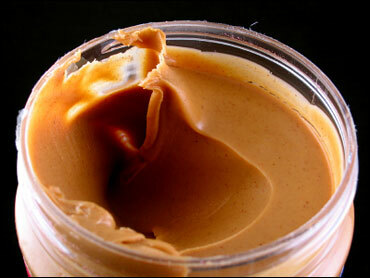 The peanut butter was distributed only through food service providers and was not sold directly to consumers. Officials are concerned the peanut butter is still being used, and Kassenborg urged institutions to toss it out. A woman in her 70s at a northern Minnesota nursing home died after contracting salmonella, although epidemiologist Stephanie Meyer of the state Health Department said it wasn't clear whether the illness or underlying health problems caused the death. The woman was not at the facility where the bacteria was initially found. The Centers for Disease Control, in a release later Monday, said the salmonella poisonings may have contributed to three deaths. The CDC didn't detail the deaths or where they occurred, and spokesman Dave Daigle said the agency would have no other details Monday. Minnesota officials took the lead because foodborne investigations typically start at the state level. Minnesota officials were coordinating their investigation with the Centers for Disease Control and Prevention, the U.S. Food and Drug Administration and other states. King Nut Companies of Solon, Ohio, on Sunday asked its customers to stop using peanut butter under its King Nut and Parnell's Pride brands with a lot code that begins with the numeral "8." Company president and chief executive Martin Kanan said Monday that Minnesota's findings validated that decision. "We did not want to wait around for the results," he said. The peanut butter King Nut distributed was manufactured by Peanut Corporation of America, a Virginia company. In an e-mail earlier Monday, President Stewart Parnell said the company was working with federal authorities. The peanut butter was distributed to establishments such as care facilities, hospitals, schools, universities and restaurants. King Nut says it was not distributed for retail sale to consumers. The CDC on Monday raised the number of confirmed cases to 410, from 399 as of Friday, and Mississippi became the 43rd state to report a case. All the illnesses began between Sept. 15 and Jan. 7, but most of the people became sick after Oct. 1. Kanan held out the possibility that the contamination came from another source, since the salmonella was found in an open container. "That means there's a possibility of cross-contamination, somebody could have been cutting a piece of chicken and then stuck the knife into the peanut butter for a peanut butter sandwich," he said. "There have been no tests that have come back positive on a closed container." The Minnesota lab took 13 samples from the container, and four of the samples, taken from different parts of the container, tested positive for salmonella. Doug Schultz, a Minnesota Health Department spokesman, said if the sample was contaminated from another source, lab tests would be expected to show positive results from near the top of the container only. But Schultz said lab workers also aim to test unopened containers of the peanut butter and are trying to get such samples from the distributor.